Securing your dentures with dental implants eliminates the need for costly and cumbersome adhesives, and prevents sore spots and slipping. 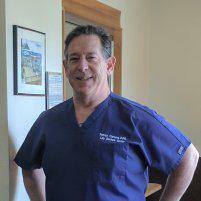 Patrick Carbone, the founder of Lilly Denture Center in Olympia, Washington, refers you to an oral surgeon for denture implants while he custom-creates your dentures. When you’re ready for the next step in denture convenience and comfort, contact Patrick’s team by phone or book a free consultation online. Denture implants are dental implants surgically placed to secure your dentures, eliminating the need for costly and messy denture adhesives. Denture implants help your dentures fit snugly, so they don’t slip, click, or cause problems with eating or speaking. How do I get denture implants? During your consultation with Patrick, you discuss the possibility of denture implants. If you decide they’re the best option for you, he refers you to an oral surgeon who inserts the dental implants. Dental implants consist of at least two titanium posts surgically placed into your gums and underlying jawbone. The posts are usually inserted into the front of your gums, as that area usually has more bone. Your jawbone takes at least five to seven months to fuse to the post, making it stable and secure. If you don’t have enough bone in your jaw, your oral surgeon takes bone grafts to build up the bone’s surface. After the bone grafts heal, your oral surgeon inserts the dental implants. A final step of the implant process is capping the implants. Your oral surgeon opens up the gum over the implants and fits each post with a metal healing cap, which guides your gums to heal correctly. After about two weeks, these are replaced with the final abutment caps. Finally, Patrick takes molds of your gums and implants, which he uses to create your custom-made dentures. He also places a metal bar across the abutments or fits them with ball-shaped attachments. The dentures clip onto these metal pieces for easy application and removal. How long until my implant-supported dentures are ready? Patrick creates temporary dentures you wear during the months of recovery from implant surgery. The temporary dentures also help him fit your final dentures. After you receive your final dentures, Patrick relines your temporary dentures and fits them with clips, too, so you can use them as backup dentures. If you want dentures that feel secure and look natural, contact Lilly Denture Center about denture implants. You can phone the office or book a free consultation online.